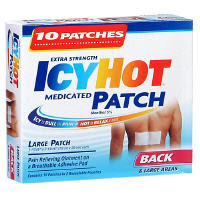 One of the things that Santa dropped into my stocking this year was none ot her than a small pack of Icy Hot patches (not the "back" ones pictured here). As the commercials say, it's icy to get rid of the pain and hot to melt it away (or something like that). It was good timing, as January/February were heavy training months for me, and there was bound to be a time when I needed them, regardless of my natural hardiness. That time came after my 20-miler. The outer side of my left foot felt bruised for some reason, so I was cutting the patches in half and putting them at my outer arch during/after runs so that I could keep going at such a critical time. The smell is not as bad as some Asian variations of the patch (like Salonpas, which I will review one day once I've tried it), but it might also mean that it is less effective. I didn't think I got any more than some temporary relief (a few minutes), probably because it didn't stick too well to that area. So if I had to change this product, I'd make it stickier and remember not to stick it to hairy areas. I will use the remaining patches for pain in less obscure areas, though. Poem: Why Do I Run?